Teeth Whitening Produces Amazing Results! Dental Crowns & Fillings Can Help Restore Your Smile!. We Recommend Regular Dental Checkups & Teeth Cleanings! Anxious About Visiting The Dentist? Sedation Dentistry May Be For You! We are pleased to offer a wide range of orthodontic services including financing options. We are pleased to offer several options for teeth whitening including in-office & take-home. We welcome children. Our team creates a friendly, caring & gentle atmosphere for kids. Suffering from dental pain? It may be an emergency! We welcome patients experiencing emergencies. Dental Crowns & Teeth Fillings can be used to restore form and function as well as enhance your smile. Our dental hygiene team does more than just clean your teeth. They help you understand your oral health. Are you afraid of visiting the dentist? 75% of Canadians say a visit to the dentist makes them anxious. 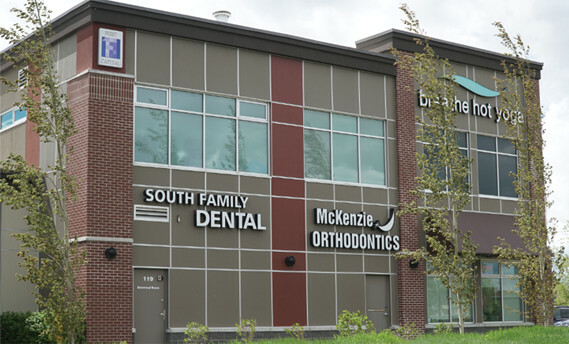 As a South Calgary General and Family Dentist, we are conveniently located in McKenzie Towne just off 52nd Street at the corner of McKenzie Towne Link SE. We are pleased to offer our patients and their families extended evening and weekend hours as well as the convenience of direct billing (also known as assignment) and affordable financing options. Our General Dental Practice is pleased to offer dental services such as Orthodontic Dentistry, Teeth Whitening, Children’s Dentistry, Emergency Dentistry, Dental Crowns & Fillings, Dental Hygiene and Sedation Dentistry for those fearful of visiting the dentist. Our friendly down to earth dental team is headed by Dr. Angela Sharma. 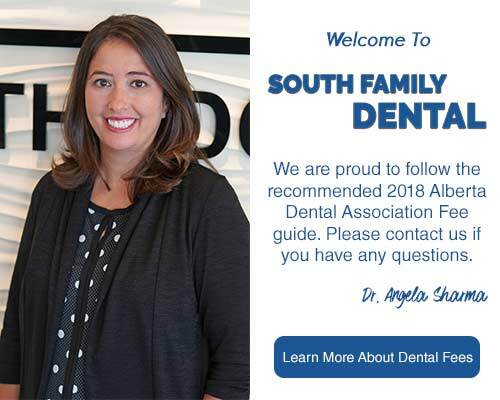 Dr. Sharma wants you to feel the South Family difference as we will provide you with that extra care and attention you are looking for. This includes warm neck wraps, heated blankets, and cable TV. It is our goal to provide you with a level of care that goes beyond your expectations and to provide you with a friendly and comfortable environment at every visit!